Private Placement Memorandum (PPM) - $45,000 fee, less legal fee of $25,000 = net fee to CFMC of $20,000. Referral fee = 10% of $20K or $2,000 paid as collected, typically in a retainer and progress payments. Financial Advisory Services – Assumes a $10 million capital solicitation. 10% fee ($1 million) to CFMC; with retainer and progress payments as draw against total fee. Further assumes a $125,000 cost of offering, such as call center staffing and other expenses, etc. Referral fee = 10% of $1 mill. (less $125K) = $875K or $87,500 paid to referral source as collected by CFMC. Feasibility Study. $28,000, less legal fee at $1,000, credentialed expert opinion letter at $1,000 and printing cost at $1,000 = $25,000 net fee to CFMC typically paid as a 50% retainer and a 50% completion fee. Referral Fee = 10% of $25K or $2,500 paid to referral source as collected by CFMC. USDA B&I Loan Application. Assumes a $7.5 million loan application with a 1% processing fee of $75,000 paid as three (3) installments of 10% each or $7,500 (retainer and two progress payments) and a final payment at closing of $52,500. 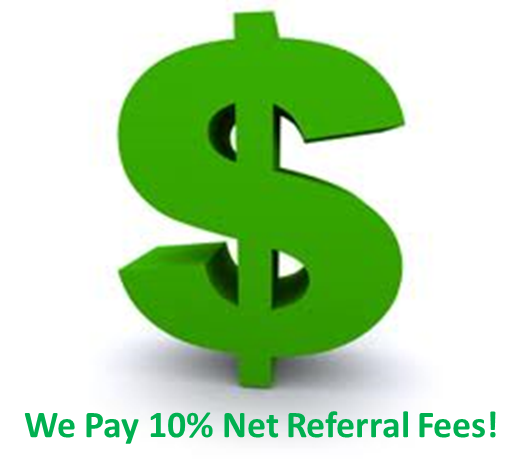 Referral Fee = 10% of the net fees to CFMC or $750 on the retainer, $750 on each progress payment and $5,250 at closing. Net fee is the key term here. It means net of any pass through expenses paid directly to an outside vendor like an attorney, credentialed expert opinion or externally and/or internally surged call center sales force to support a specific transaction.